It hasn't been quite that hot here but it is in the 90s and I've been noticing my cucumbers wilting in the heat more than my squash. I was out of town for a couple of weeks and they were looking rough when I got home (my watering backup doesn't realize just how much the ground needs to be saturated in this heat). I've been watering them once daily now and they've perked back up but I lost some of the fruit that had been forming before I left. I'm only growing summer squash this year but last year I do remember my butternut squash looking wilted during the heat of the day and I ended up losing one of them by late August. I've been saying butternut and hubbard. One is a classic butternut. What do the blossoms look like? Can you post a picture? (See if they have extra long calyces) I'm not seeing spines on the leaf stems... Does it have peach fuzz instead? If so, this might be a C.moschata. Maybe a butternut cross ...with something like Long Island Cheese? The shape could still be a Seminole Pumpkin, too. 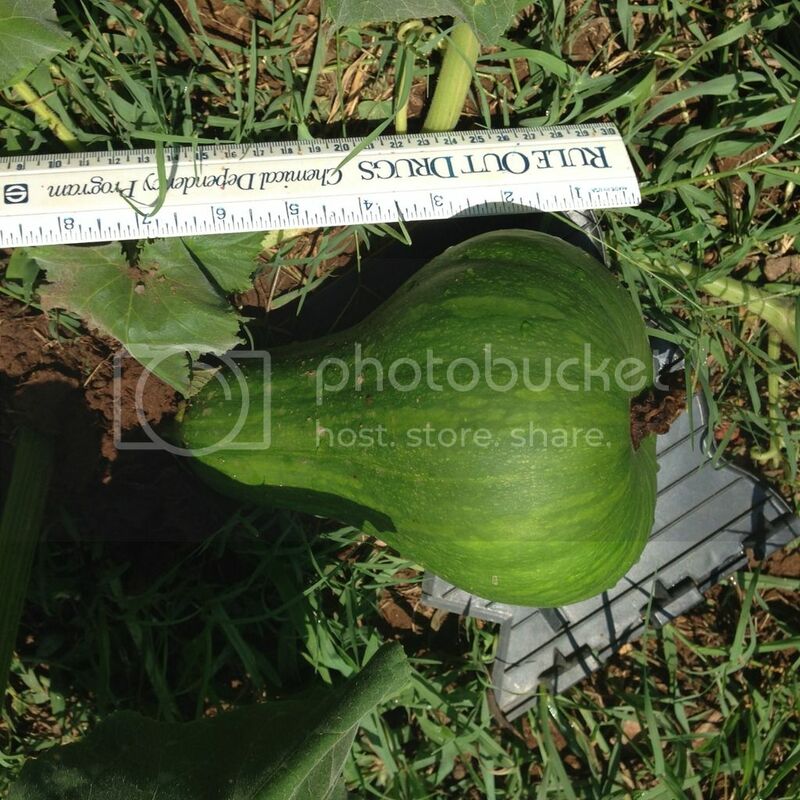 yeah, the stem looks pretty moschata, if maybe a little thick in that first pic. i've seen that thickening happen occasionally, spontaneously in butternuts...could also be a sign of an interspecies cross if you're using saved seed. they're not all that uncommon. Im growing a variety of Zucchini called "Sure Thing". I bought the seeds from here. Scroll down and you'll see them. I also purchased Tarminofi Hybrid. Ive read up on this "Sure Thing" variety, and discovered that its a seedless variety also. Am I correct in assuming that I do not need to hand pollinate these? Or pollinate them at all? So far I have not hand pollinated them, and they are growing extremely well. I have two good 5 inch zucchinis growing well over the last week. yeah, I think might be the seminole pumpkin. Those and the butternuts are still hanging in there, wilting in the hot sun and then perking up again in the evening, even without water. If it's Seminole, they are supposed to be pretty productive. I hope you'll be happy with them. @Toxic, sounds like you have a Parthenocarpic variety that won't need to be pollinated. My H-19 Littleleaf cucumber is supposed to be Parthenocarpic. Yesterday, I found FOUR fruits hiding near the bottom of the vines under the leaves getting larger than I wanted them to. Take it from a person that lives in the hot irrigated desert of Central Ca. where it's always hot, sunny, and dry. I H2O the snot out of my squashes everyday, basically flood them to death and they come back for more. With no clouds from May - Oct. I even have to pitch a shade tent over them to shade the hot sun and they perk right up. I do the same for Cucks and Peppers when they get that way too. Otherwise my peppers get will nasty sun scorched if I don't. Learning new gardening terminology again today... parthenocarpic! LOL. Thanks applestar... Im trying this variety as a lower maintenance variety, so next year when me and wife are in France for 5 weeks, the neighbour has less work to do! If they work out well this year, Ill grow them again next year. Weird thing is they are growing both male and female flowers still. I found the females have much larger insides once the flowers open vs the other varieties of zucchini. Question... How many zucchinis should you let grow on one plant at any given time. One of mine has three female on it as of this morning. Should I restrict any others from growing? Or should I let it produce at its own ability? greenstubbs.... I would agree with the excessive watering plan. I have four zucchini plants in my greenhouse. I need to water them in the morning and then the evening on hotter days. Otherwise they wilt and then come back again within about hour of supply a drowning amount of water. I have them in pots that are bout 7 gallons. Might be a bit small, but this years zucchinis are doing wonderful compared to last year. They grow so fast, and once they start producing, its almost daily changes in the size of the zucchini. I want to make sure they don't grow too quick and crack/ split on the outer skin like they did last year. Do any of you provide support for your zucchini leaves. Mine are huge, and long and getting heavy. Im worried they may topped over the containers and damage the stems. Is it normal? Last years did not get this big. If I guessed they are easily 4 foot (leaf to opposite side leaf), and about 3 feet tall. Hate touching them as I always forget about how spiny they are. lol. I don't restrict the number of fruits on my zucchini plants. If things are as they should be, I harvest them at about 6 or 7 inches long so they aren't on there very long anyway and they just keep pumping out more. But, what usually goes wrong is that I neglect the plant then come back and find baseball bat size zucchini! 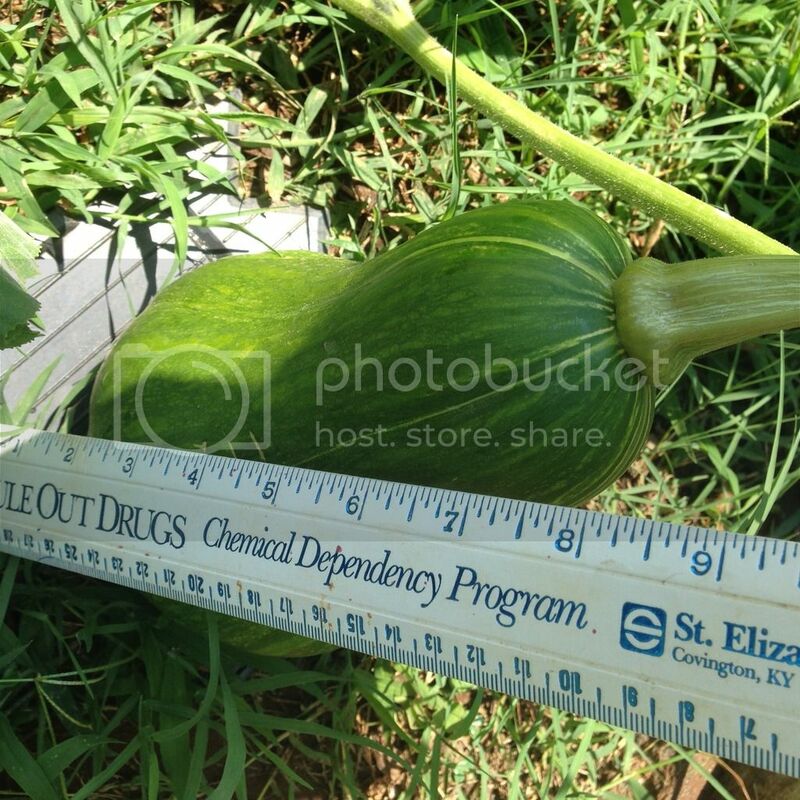 If you're saying the whole zucchini plant is about 4 feet across and 3 feet high that sounds about normal. Sometimes mine get 6 feet wide easily. This year I had a volunteer "zucchini" come up and I let it grow because it was way ahead of the ones I planted. The leaves were the biggest I've ever seen, deep green, huge. But, I think the seed was a cross from some other squash I had in there last year, because it only gave tiny little zucchinis which refused to grow any bigger than about 4 inches, and only the diameter of say, my middle finger. I finally pulled up the 2 plants because they were encroaching on everything else. Sure gave me lotsa mulch! I've had that problem too in Florida the last couple of years with the white patty pan squash that I like. I've read that you should wrap foil around the stems of the plants to discourage the squash borers. I haven't tried spraying with BT though like Peter1142 suggested. I wanted to grow things organically but that doesn't seem to work here so BT may be the next try for me. Bt is strictly organic. It stands for Bacillus thuringiensis. It is a bacterium that only infects certain types of caterpillars and is completely harmless to everything else. Another possibility that has been mentioned here is coating the base of the stems with tanglefoot, a very sticky substance used as an insect barrier. I want to try that. I have tried the foil in the past. It is hard to keep it wrapped tight enough to keep them out; I still lost my plants. I'm fortunate here in that I'm not bothered by the SVB. Only one time a few years ago I planted a couple of zucchini plants and they kept wilting down. I would water them and they'd come back but wilt down again. Finally they gave up the ghost. I'd never heard of the SVB then and just thought well who knows, some root disease. I replanted and the new plants were fine. It only happened that one time. I know now it must have been an attack of the SVB. I didn't know what to look for back then. Across the valley at a little lower elevation I've heard they have SVB. Even butternut are affected I've heard. So these seminole pumpkins or whatever they are, are ripening up. How do I know when to harvest them?